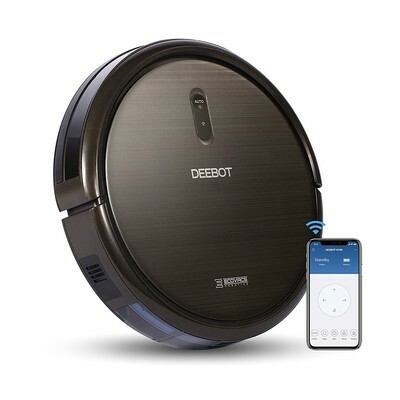 The Ecovacs Deebot N79S robotic vacuum cleaner is down to $179.98 with code FPCIH96U on Amazon. That price is by far the lowest we’ve ever seen this vacuum go and probably won’t last very long. We have shared deals on the previous generation, the Deebot N79, before. The difference is a pretty big improvement. The N79S adds a Max Power function, which increases the suction by 50% when you need it. It also adds compatibility with Amazon’s Alexa, which means if you connect it to an Echo Dot or something similar you can control the N79S with your voice. The N79S has a three-stage cleaning system, which includes high-efficiency suction, a deep reach main brush, and wide-reach side brushes. The battery life lasts for just under two hours, and it will return to the docking station automatically when it runs low. It has sensors that help prevent collisions and falls. It comes with a one-year warranty, and users give it 4.3 stars based on 541 reviews. ← Enter our Galaxy S9 and Mophie Charge Stream Pad+ Giveaway and win!